My favorite time of year is summer, however it can be a very dangerous time of year if you do not take the proper precautions in taking care of oneself. This especially goes for seniors. Now I am not saying that just because you are a senior not to go into the sun and have fun, just that as our bodies get older it becomes a little tougher to handle things we once were able to. Heat can do a great deal of damage to anyone. Now if you are on certain medications the heat can be an even worse enemy if you do not take great caution when you go out into it. Below I am going to write some summer safety tips for senior citizens that will help you better withstand the vicious heat this coming summer and the future summers to come. The most important thing you are going to want to remember is to drink plenty of water. Even if you do not feel thirsty, the heat will make you sweat all of it right out. This will make you become dehydrated and sick, so drink all of the water you can if you are going to be out in the heat. Even if you are not still drink water. Keep your skin covered- That sun can bake your skin without you even knowing it is happening. Get a suntan lotion that has a good deal of spf in it. 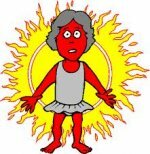 You can get skin cancer from to much deep exposure to the sun. Also you may want to wear a hat that can protect the face as well. Do not over work yourself if the sun is beating down outside try to limit working out or doing things that will cause you to use a lot of energy, this can cause you to pass out from heat stroke. Plus the hotter it is the more you sweat which is using up more of the body's water mass, causing you to again dehydrate quicker. If you are going to the beach or doing something outside that requires you to exert yourself a good deal please try to take breaks in between what you are doing, so you ca give your body the rest it needs to re energize itself. If you are just sitting outside to enjoy some fresh air try to find a spot that is more shady. Wear clothes that are lightly colored and real loose fitting. Stay away from things that have caffeine in them on real hot days, caffeine will be one of the quickest things that will dehydrate you. This is a small portion of things that senior citizens can do to keep yourself protected against this Summer's vicious ways. Your body is very important and you do not want to have any problems due to the suns harmful ways. You can enjoy the sun all you want and live it up, just do this in a smart and safe way. Remember this is the only body you have and can not change it as you go. Value what you have. 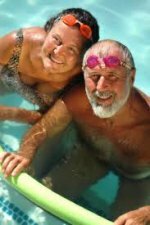 Share a link to a page on Senior Citizen Summer Safety Tips and we will consider it for placement on this page.